A circular saw, not surprisingly, is a saw with a blade that moves in a circular direction. 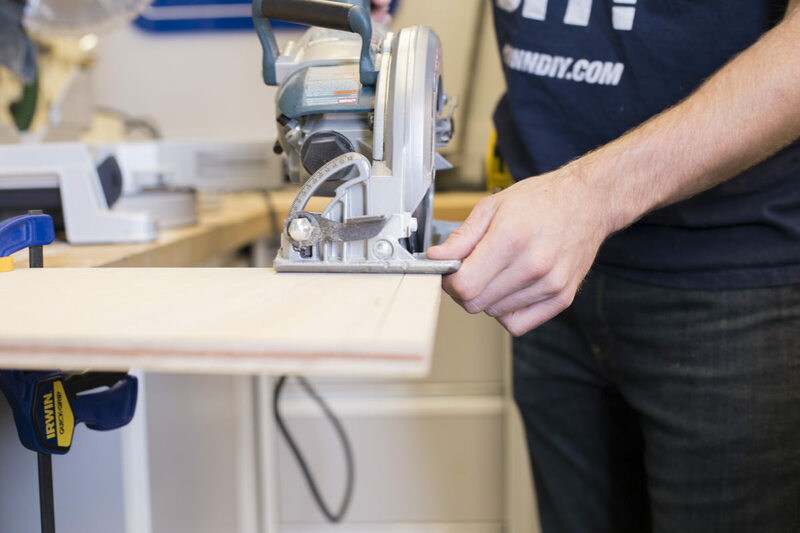 A circular saw can be a great substitute for a miter saw and is able to make straight cuts, angle cuts, and bevel cuts. It’s smaller, hand held, and less expensive than. 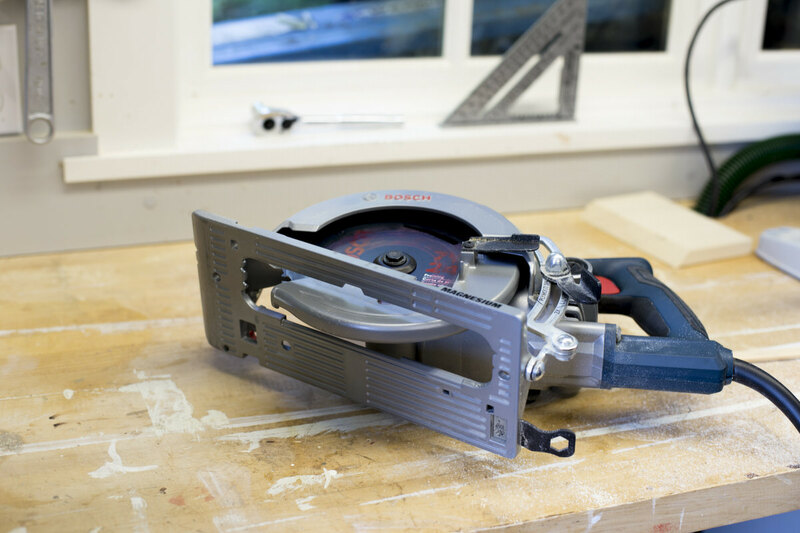 A circular saw can also make straight or beveled cuts in sheet goods or lumber too wide for a miter saw. A hand held power saw really takes both hands and your full attention to operate. So it’s especially important here to keep everything free of the path of the blade. If you’re wearing long sleeves, take a minute to roll them up before you start working. Wear fitted clothing that won’t hang down and risk getting caught in the blade. Any jewelry that isn’t firmly set in place (i. e. a dangling necklace, or a loose bracelet) should be removed. Long hair can be a danger if you’re not careful, so go ahead and tie or pin it back to keep it out of your face and away from that blade. Due to kickback, never stand directly behind the saw while cutting, but always slightly off to the side. 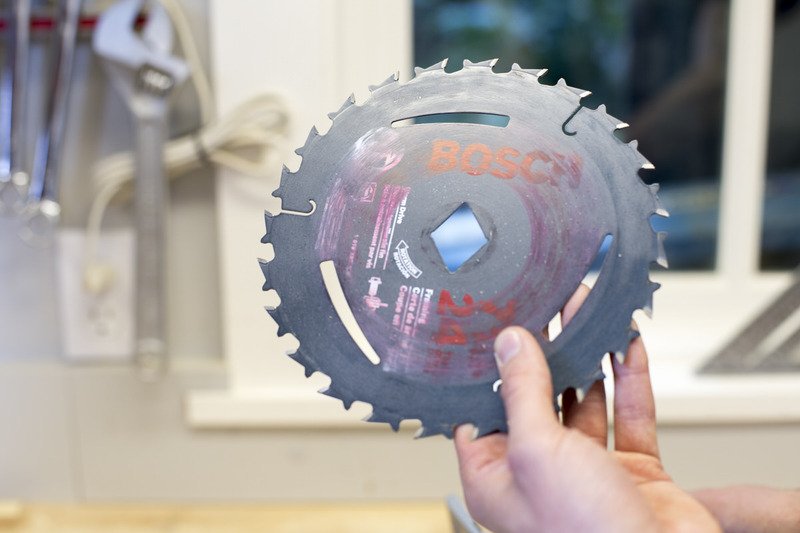 A saw blade is most in your control when it’s standing still or when it’s running at full speed. Some of the highest risk is when the blade is in the process of starting up or slowing down. At half speed the blade isn’t powerful enough to cut through wood, but it is likely more powerful than you and is likely to buck or to catch up wood and throw it. Always make sure to wear safety glasses to protect your eyes. Power saws can be extremely loud and are potentially damaging to your hearing, so protect your ears with earmuffs or earplugs. To keep the saw blade as much in your control as possible, start the blade away from the wood and don’t make contact until the blade has reached full speed. If ending the cut in the wood, allow the blade to come to a complete stop before raising it out of the wood. Otherwise, cut through the wood fully before releasing the trigger and allowing the blade to come to a complete stop. While cutting keep both hands on the saw. Always unplug your saw when not in use or when performing maintenance. Remove blade when not in use. 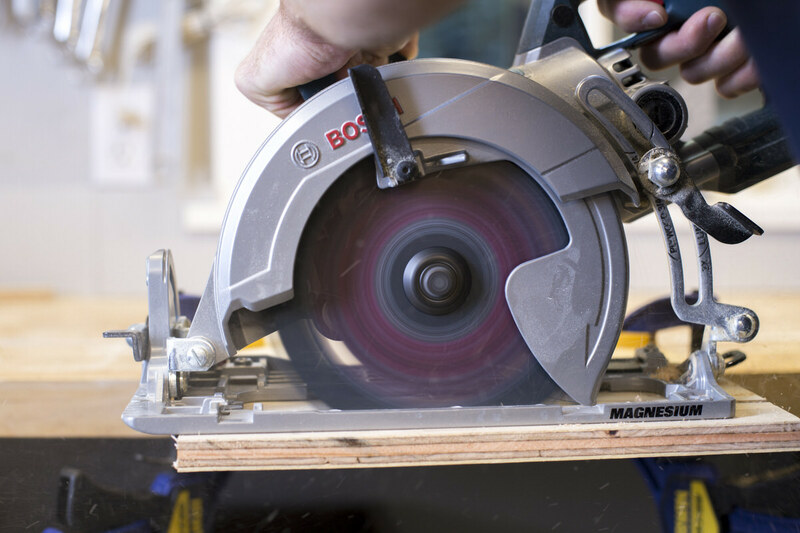 Before using a circular saw, securely clamp down the material you’ll be cutting. Position the clamps as close to the cut as possible for stability. 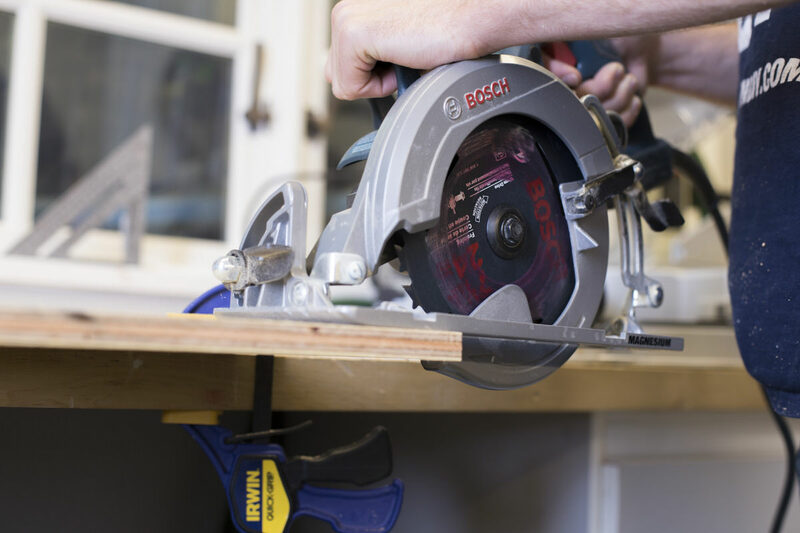 Always clamp down your material with overhang rather than with two points of pressure on either side of the cut that will cause the material to buckle. With a pencil and guide, mark the path for the circular saw blade to follow. The guide on the saw blocks several inches in front of the blade and so the pencil line will need to be extended out beyond this point in order to follow it. Position the base of the saw on the wood lining up the guide with the pencil line, but keeping the saw away from the wood. Start the saw before making contact with the wood. Don’t over apply pressure while cutting; let the saw do the work. 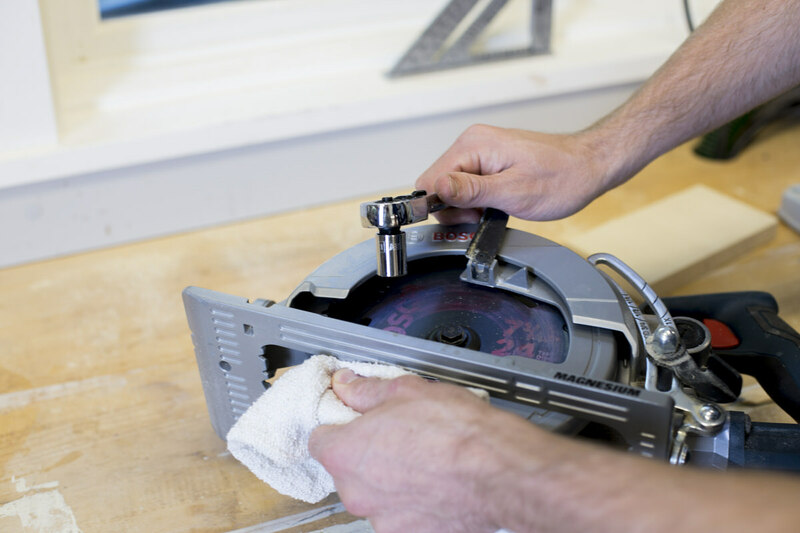 Cutting through masking tape can help prevent jagged edges on your material. Be careful to keep a straight line so that the saw blade doesn’t bind (i.e. get caught in the wood). If binding occurs, release the trigger, allowing the blade to come to a complete stop. 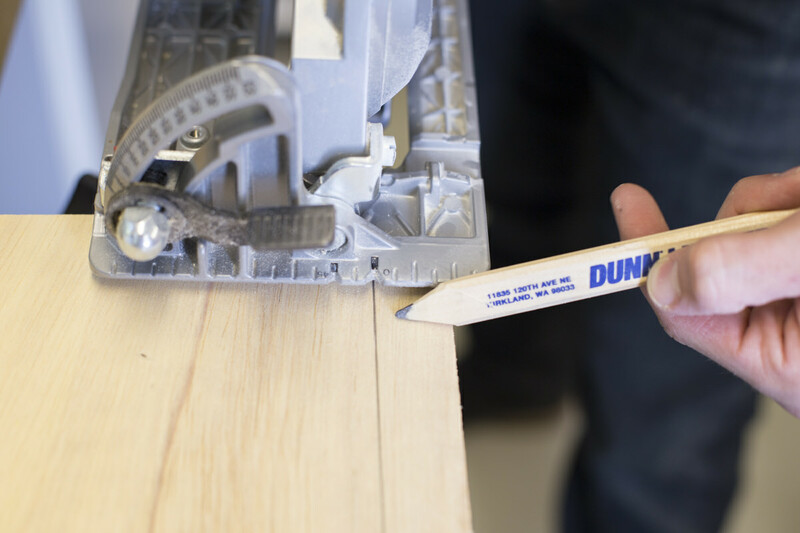 Work the blade free of the wood and return to the cut with the blade path straightened out. Change blades when they become dull, when working with a different material, or when needing a finer (or rougher) cut. 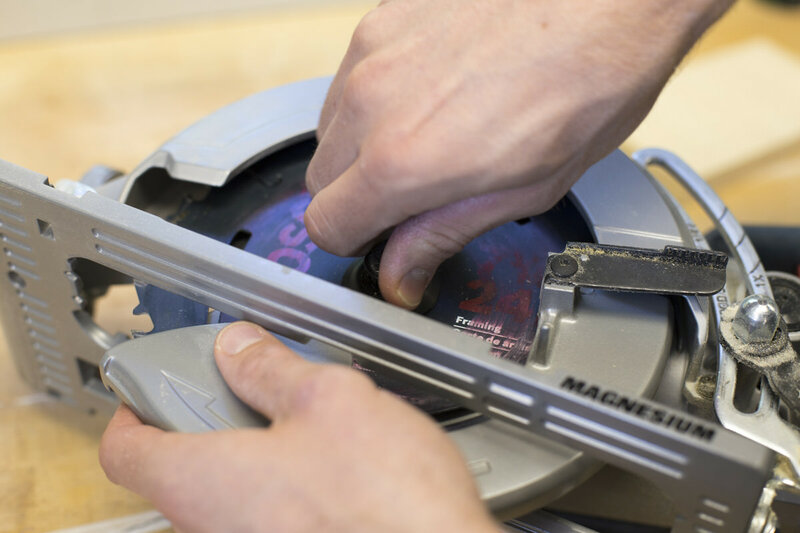 Always unplug the saw (or remove the battery) before adjusting or removing blades.